Station 56 and the Somerville Rescue Squad hosted a three day trench rescue training class by Rescue Products International. Trench rescue Awareness was the topic for all responders Friday night. Saturday and Sunday the class was split into two groups. The first group was for members that have not had previous training. This group received the trench rescue operations certification. The second group consisted of members that have operations level training. The second group worked on more technical scenarios such as deep trenches and “L” trenches. This training earned them the trench technician certification. Congratulations to all the members from both organizations that participated in this extensive and demanding training. Fire District No. 1 was dispatched to a fire alarm activation at a electronics reclamation facility on Apgar Drive. During the response the incident was upgraded to a reported fire involving a piece of machinery inside the building. Car 26 immediately upgraded the response to a second alarm. The first arriving units found a fire in a plastic compacting machine. A lithium battery was inadvertently left inside one of the items being compacted which shorted and started the large mass of plastic on fire. The fire was partially controlled by the building occupants. Engine 561 and FM8 units stretched a hose line into the building to complete extinguishment. Extensive ventilation was needed to clear the building of the remaining smoke. Units operated on the scene for approximately two hours. 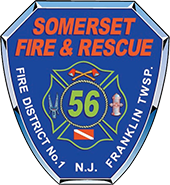 The cause of the fire was investigated by the Franklin Township Fire Prevention Department.